Santa Fe, NM, April 22, 2010 – Jenny Sanborn and Issa Nyaphaga are gearing up for their second joint trip to Cameroon to deliver wheelchairs, medical equipment and medical aid to improve life for Tikar and Pygmy people with disabilities. Sanborn, a volunteer with Soulful Presence, a Santa Fe-based nonprofit organization, and Nyaphaga, the founder of Hope International for Tikar People (HITIP), made a previous trip to the remote Tikar region of Cameroon last October. This time, there’s a benefit concert by the Sierra Leone Refugee All Stars at the Santa Fe Brewing Company on May 5 to help fund the project. 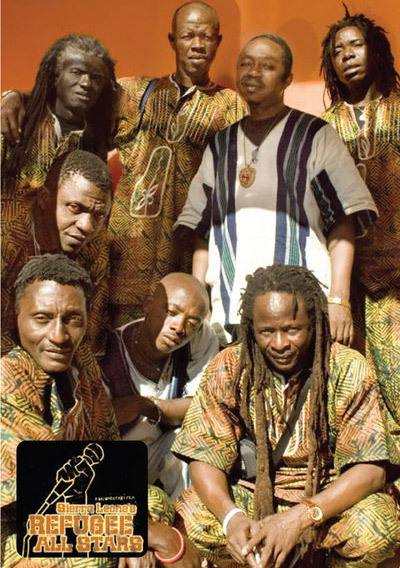 The All Stars are a group of musicians who began playing in a refugee camp, and now are internationally renowned, with albums and a documentary about them that was shown on PBS. People in Santa Fe and beyond can support these efforts by buying tickets to the May 5 Sierra Leone All Stars concert being presented by Southwest Roots Music and 98.1 KBAC Radio Free Santa Fe. Tickets are available through the Lensic Box office, 505-988-1234, $25 in advance. Donations for the trip are also being accepted directly at the Soulful Presence website, http://www.soulfulpresence.org/donate.php. “One of the reasons people end up with amputations in these villages is they can’t get access to medical care so when a wound becomes infected, the limb is just amputated. They can’t afford transportation to a city, let alone pay for a doctor’s visit,” Sanborn explains. The wheelchairs that will be purchased with donations will be Cameroonian-produced three-wheelers,designed to help villagers travel long distances over dirt roads and rough terrain. Built from bicycle parts, they allow people with disabilities in Cameroon to lead more productive lives and travel to school and work. Nyaphaga, an exiled Cameroonian artist, started HITIP in 2002 after being inspired by a young polio survivor with disabilities in his native country. This led the artist to raise funds to purchase a wheelchair and deliver it to Ibrahim, helping to fulfill the boy’s dream of freedom. Today Ibrahim is a mechanic and electrician who repairs others’ wheelchairs and coaches the village soccer team, activities he’d been unable to accomplish prior to receiving his wheelchair. Soulful Presence was founded by Marcie Davis, a Santa Fe businesswoman and wheelchair user, who also advocates for people with disabilities in the US and abroad. The two organizations joined forces after Nyaphaga came to Santa Fe for an artist’s residency program at the Art Institute. HITIP is a nonprofit, community based organization established to improve the quality of life for marginalized indigenous Tikar and Pygmy people in Cameroon, Africa. Soulful Presence (www.soulfulpresence.org) and HITIP (www.hitip.org) have united to improve the quality of life for Tikar and Pygmy people with disabilities in Cameroon. Together, we are committed to delivering quality, appropriate medical equipment and supplies thus encouraging increased self-reliance and economic independence. For more information contact: Marcie Davis at 505-982-1977.